Lady Skywriter had the pleasure of meeting Harry Chin at the NWA History Centre in 2011. 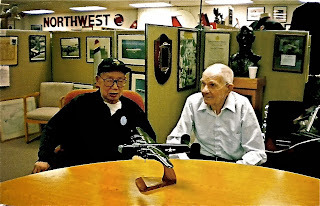 His daughter Sheila Morris and her husband Rick brought Harry from his home in Waseca, Minn. to visit the museum and meet John Peterson, who was the first Crew Chief at the MOD Center at Holman Field, St. Paul. At the MOD Center (Bomber Modification Center) Northwest Airlines installed Radome and Nordic bombsights on B-24s. Harry also installed gas tanks on B-25s for the British. For more information on Harry Chin and the amazing WWII effort in St. Paul by Northwest Airlines, please see the Fall, 2011 issue of Reflections, the NWAHC newsletter.